We'll begin accepting donations at our newest Goodwill Donation Center located in the Red Top Plaza at 1316 S. Milwaukee Avenue in Libertyville on July 26th. We offer a convenient drive-up with friendly donation attendants who will help you unload your car, seven days a week. Your donations of gently used clothing and household items support Goodwill’s mission of providing training and jobs for people with disabilities and disadvantages. Plus, you’re keeping usable items out of landfills! 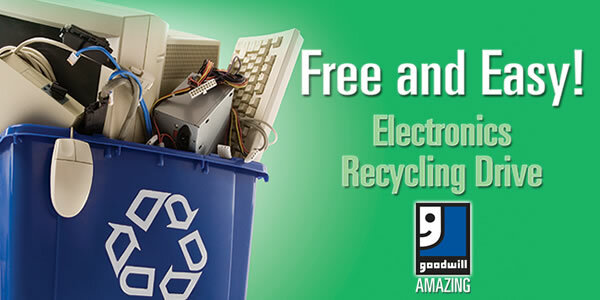 Bring your old CPU's hard drives, towers, printers, keyboards, mice, monitors and cell phones to Goodwill's Electronics Recycling Drive! We're partnered with Dell Reconnect and we'll properly recycle your old equipment.